Marvel have a new film "in the works" in the shape of Muslim superhero Ms Marvel. It won't be the studio's first female-led film - Brie Larson is already set to enter the franchise as Captain Marvel in 2019. Avengers Infinity War producer Kevin Feige told the BBC: "Ms. Marvel... is definitely sort of in the works." He explained she is "another character in the comic books, the Muslim hero who is inspired by Captain Marvel". "We have plans for that once we've introduced Captain Marvel to the world," he added. 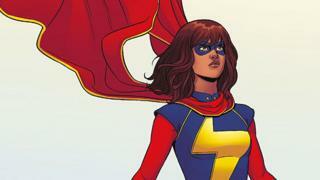 In the comic books, Ms Marvel's alter-ego is Kamala Khan, a Pakistani-American teenager from New Jersey. Who could play Ms Marvel? Several fans voiced their support for Chopra - but some said the role should go to a Pakistani-American rather than Indian. Vishhal tweeted: "This is awesome but fans need to stop suggesting Priyanka Chopra. "Sure she voiced the character in a game but we need a Pakistani actress around the same age as Tom Holland." Steven agreed: "Why does everybody want Priyanka Chopra as Ms. Marvel? Kamala Khan is Pakistani not Indian. And she's supposed to be a teenager." But Sheza tweeted: "We are here for Priyanka Chopra playing the role. You can take all of my money."